Football Unites Captains Program tour of Baptist H…rn University. 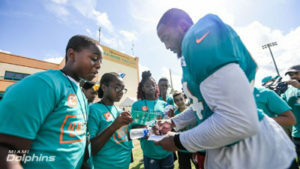 MIAMI – The Miami Dolphins announced the creation of the Football Unites Captains Program, a diversity and inclusion initiative that will bring 80 to 100 middle school students from various backgrounds together once a month for a day of learning about tolerance, acceptance and leadership. Dolphins players and alumni will join these students to share their stories, perspectives, and experiences. The Ross Initiative in Sports for Equality (RISE) will assist with programming and program evaluation. Miami Dolphins DE Robert Quinn meets Footb…ram students. Participating students will come from the following organizations: The Alliance for GLBTQ Youth, Boys & Girls Club of Broward County, youth from the Israeli Consulate in Miami, North Miami PAL, North Miami Beach PAL, and the Greater Miami Pop Warner Tamiami Colts Jr. Varsity football program. Through Football Unites, the organization has created opportunities for South Florida-based groups to strengthen and expand their impact around community engagement, education, and criminal justice reform. The team chose 11 recipients to receive Football Unites grants for the 2018 season. This diverse set of recipients includes Art Detectives, Community Justice Project, Inc., Miami Gardens Police Department, National Organization of Black Law Executives South Florida Chapter (NOBLE), North Miami Police Athletic League, North Miami Beach Police Athletic League, Pridelines, SAVE, Trayvon Martin Foundation, Urban League of Broward County, and YWCA Miami. The grant recipients are in addition to an announcement by Stephen Ross and the 5000 Role Models of Excellence Project of a long-term partnership, centering on social justice, education and police, and youth relations. The cornerstones of the partnership are the 5000 Role Models Police and Youth Conference and a College Academic Signing Day for Wilson Scholars at Hard Rock Stadium. In addition, the Dolphins will continue pre-existing programs with the 5000 Role Models of Excellence Project and amplify new events. In all, these social justice community initiatives will impact more than 10,000 Role Models.